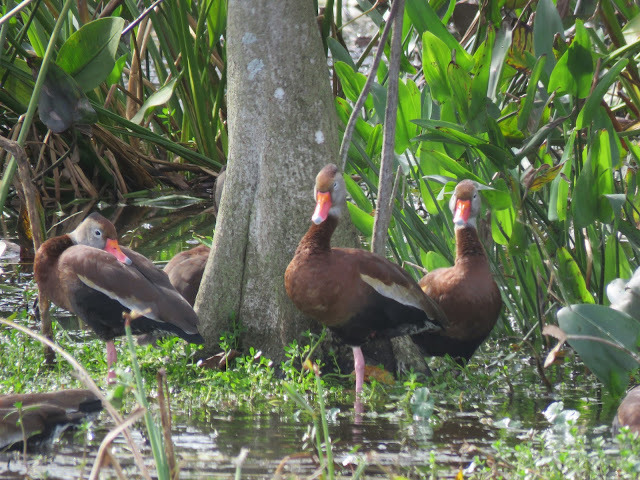 The Black-bellied Whistling Ducks are always a great sighting for me. I remember Theresa aka Tex, from the Round*A*Round Ranch blog posting her Whistling Ducks photos. They are so cute and I love hearing their sounds. These ducks were seen during our Florida trip at the Wakodahatchee Wetlands. I miss Tex and her blog and photos. Speaking of bloggers gone missing, I am also missing Christine from Ireland and her blog was Christine and her Camera. I hope both Theresa, Christine and other bloggers that are MIA are all doing well. ...great shots, enjoy your weekend. All those years I lived in Florida, I don't think I've ever seen a whistling duck. They sure are cute. Yes, I miss Tex too, and those whistling ducks, the pond with reflections and all else, and wish her many happy days, Here's to you Tex, wherever you are and whatever you are doing now. They almost look as though they are talking to each other amongst the reeds. Beautiful pictures of these geese. the third photo is my favorite. Do you want to place my link, I still can not. The Whistling ducks look happy. Great sighting. If we want to see live ducks, we will have to visit the duck farm. These ducks are amazing... also these are new to me, so thanks for sharing. Have a beautiful weekend, filled with captures! Thanks for your help last week with the ID of the Pine Warbler. Very beautiful post with lovely ducks! Great shots of these beautiful birds! 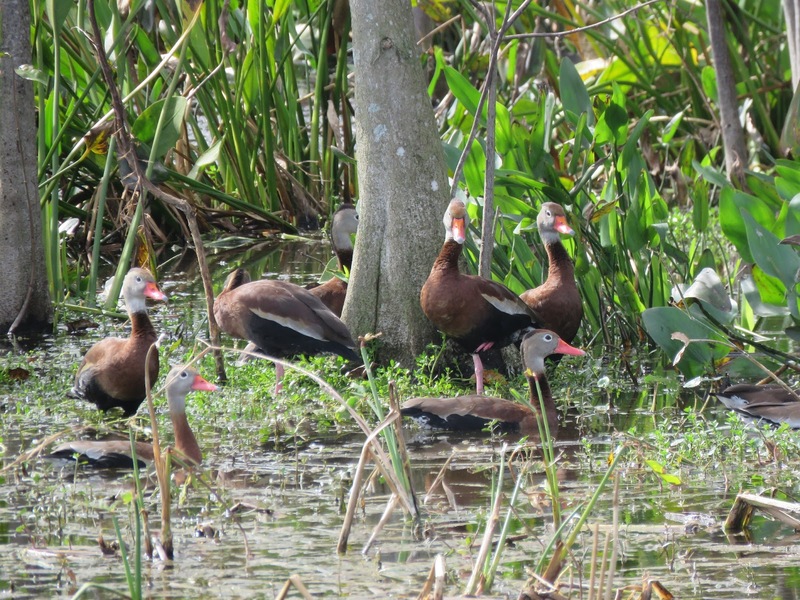 When I first visited Wakodahatchee Wetlands about 10 years ago I don't remember seeing any Whistling Ducks. Now they are so common there. I particularly like the first in this series as the patterning is particularly pleasing to the eye! Beautiful ducks, I especially loved the 1st photo. Thos ducks are beautiful. I never heard of whistling ducks before but I have now thanks to you. Thanks for hosting and have a wonderful day and weekend. Nice pictures of these special kind of Ducks. So very nice. Hi Eileen. 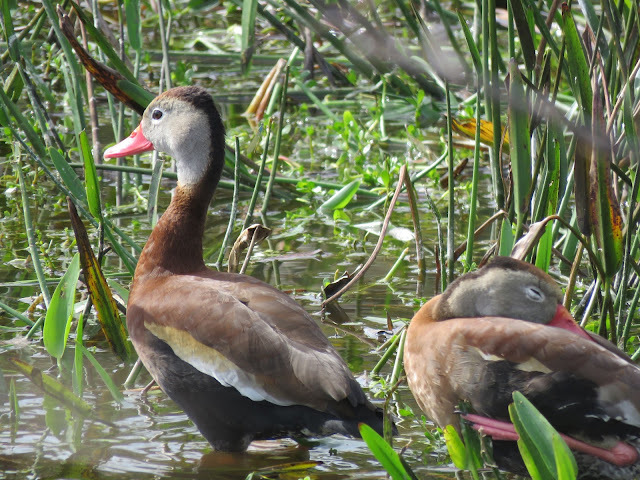 I used to so enjoy Theresa's Whistling Ducks so it's good to reacquaint with them through your own pictures. It's not a species we have in the UK but I'm sure it would fit in. Never even seen them in wildfowl collections but I guess there are some. Have a happy weekend and thanks for the link-up. Yes, they are wonderful-looking birds, Eileen! Nice photos. PS: Thanks for hosting, Eileen! Wonderful photos of the ducks. Love ducks and your captures! Have a great new week, Eileen! Just returned from Costa Rica where we saw many Black-bellied Whistling Ducks, mainly at Palo Verde but at other locations too. Dearest Eileen; I miss some of the blogger friends who retired from blogger and miss Tex. as well!!! Thank you very much for hosting and sweet comments. I"ve been MIA for ages, and don't really know how much longer I will continue. I'm probably only posting now because of the awful weather and not being able to get out much. Those whistling ducks are lovely. Nice photos! I've seen these guys just a couple of times and it was cool to hear their "whistling". awww, hi, sweet lady! a little birdie told me you posted those silly whistlers today and mentioned me. i had to come out of hiding and visit. :) yes, they are adorable, silly, wonderful and loud characters. you and your followers that remember me are so very kind. i am well. life has changed a lot. a lot. but i continue the adventure of life and love. That's a nice big flock and you're right...it makes me think of Tex to see them! I miss her! I think we saw some of these at Tuscawilla Park...where you went when you were here! Enjoy your weekend! Eileen, enjoyed the photos of the Black-bellied Whistling Ducks. Thanks for sharing. Yes! Here's to our blogger family, of which you are mayour, Eileen! Hey there Tex! I see you here! Hope you are doing well my friend! Hugs! beautiful pictures of the whistling ducks, tex was the first thing i thought of too. i miss her so much!! christine also, what happened to her?? Yes, I remember Tex and her whistling ducks. She did give us notice that she was stopping blogging. Wonderful photos of these ducks, Eileen. Happy Saturday to you. I remember Christine and her Camera. Hope she is find. Those whistling ducks are lovely. I've never seen any like that! Those ducks charmed me the first time I saw them and always wanted some. That is until I got some pekings and very time I filled a bucket of water they were there to jump in it and splash.Sometimes a bit of a pain, since I wanted clean water to water critters. Nice to have in a proper place and still would like to have a few in the garden. Yes, I miss both of those bloggers. Eileen - adorable photos. When I glanced quickly at the first one, I thought it was one duck with multiple heads! Thanks for hosting, and enjoy the rest of your weekend! Good day Eileen, well.....ducks have always been a favorite of mine, from the white ducks my Grandparents had on their farm. I used to be sent to gather the eggs for breakfast. As children, we would sneak up on them to see them fly to the pond. Years later, when I divorced my 1st husband I bought myself a little duck figurine as a gift to myself, just because I was now in control of my own money and could. That little duck has been a constant reminder of the strong woman I am. Then I met my now husband and when I found out he can talk like Donald Duck.....I was in heaven. He makes me laugh with that voice all the time. I cannot be angry with him for any reason when he talks in that voice. Ha, ha! And he knows it. Thanks for sharing your wonderful photos. I will have to check out those whistling ducks. 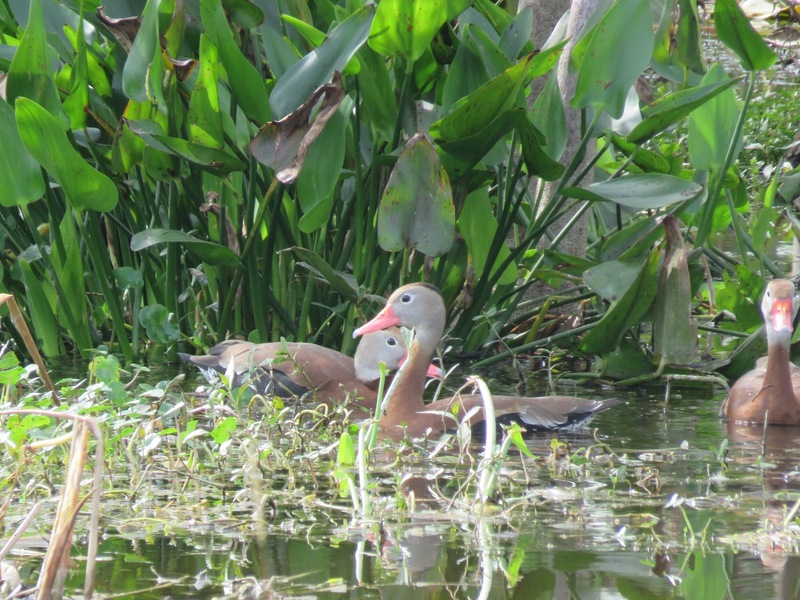 Love those 'whistling ducks' ~ and wonderful nature photography! I love Tex as well, one day??????? Beautiful photos Eileen. I love seeing these guys again after seeing them so often on Tex's blog! How wonderful that she left a comment for you today Eileen! Not reading the text yet, but watching the pictures I remembered that often these ducks were in Tex posts. I miss her too. Best wishes and nice Sunday. Great shots and what a fun name they have. Wow, i love these ! Very nice ! Oh, Eileen, I still miss Tex so much...and I miss Christine and her Camera. And I yet miss EG Tour Guide. I still find it hard to believe that that happened to her and her husband. I think you spoke for a bunch of us with Tex... and probably Christine, too. Sad, but not much we can do about it. I think it has to do with everything spinning faster and faster nowadays. Saw the first ones at Anahuac NWR in TX was soooo exciting I didn't know they were in FL..how cool!! You got some awesome photos! Love the whistling ducks! Yes, I'm sad when a favorite bloggers suddenly stops posting. These critters are cute. They look cheeky and I love their pink beak. They're so cute! I thought of Run Around Ranch as soon as I saw these. LOVE you bbwd photos Eileen. And...Thanks for sharing with us at I'd Rather B Birdin this week and for the birthday wishes. Your critter images are always so beautiful. Uma maravilha esta sequência de fotografias, aproveito para desejar um bom Domingo. I've been missing too, but only having fun and enjoying life. I'm slowing getting back to Blogging myself so it was lovely to be back here and to see the Whistling Ducks as they are new to me! OH Eileen, your photographs of your viewing are always just amazing!! OH, I miss Tex and her blog! Wonder about her so often. Have a great day! Bet you are out and about with your camera! Those ducks are very well camouflaged. Beautiful pictures happy Sunday! Wonderful duck photos, Eileen, and I do remember Theresa! Glad to hear all is well with her. De niña los cuidaba en los pastizales de la caza de zorros y para que no se escaparan por un río...siempre me gusto buscar sus nidos. So lovely to see a comment from Theresa - pleased that all is well with her.